I know my kids and my husband pretty well and cauliflower isn’t on the “LIKE” list for any of them! I knew my cousin, Amanda, was coming for dinner before our weekly dodgeball game and she was eating here….so I shot her a text asking if she liked cauliflower, she said yes….and it worked out beautifully! 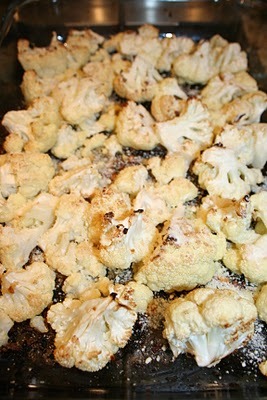 The recipe I received was from Lisa and it’s Roasted Cauliflower (from Simply Recipes) and it was delicious! I followed the recipe exactly (only omitted the salt and pepper — I never use it) because I hardly make cauliflower and I didn’t want to mess it up! Everyone tried it and BOTH of my girls ate it. Joe tried 1 piece and thought it was OK……but that’s to be expected since he doesn’t love veggies! My cousin Amanda thought it was delicious, and we had a surprise dinner guest (my best friend who came over to get ready for dodgeball) and she thought it was delicious too! It’s a keeper in this house!!! Thanks Lisa!!! Because it was a dodgeball night I had to make something quick and easy so I made chicken cutlets and biscuits with it! If the oven hasn’t reached 400°F yet, set aside until it has. Place casserole in the hot oven, uncovered, for 25-30 minutes, or until the top is lightly brown. Fork should be able to easily pierce the cauliflower. Remove from oven and sprinkle generously with Parmesan cheese. Serve immediately.